Nestled in a pocket glen, in the hills above Pitlochry in the southern highlands, lies Edradour, the smallest distillery in Scotland. The neat cluster of buildings, virtually unchanged in the last 150 years, houses equipment only just capable of producing commercial quantities. Indeed, only 12 casks a week are produced, making Edradour Single Malt Whisky a rare pleasure for a fortunate few. Using skills handed down over the generations, the men of Edradour Distillery follow the standards of those who have gone before. Only three in number , as there always have been, they continue to produce the finest single malt whisky available. A truly hand-crafted malt, Edradour is golden in the glass (natural colour), with a delicious aroma of sugared almonds and a hint of Oloroso. The smooth, creamy, light malty taste is followed by a mellow warming finish. Not to be confused with Erebor, a dragon doesn’t live here and dwarves are not trying to claim back their home. Apart from those two simple facts, Edradour could be straight out of fantasy fiction (Lord of the Rings/The Hobbit) with its beautiful little collection of buildings nestled out of sight of the excise men, Orcs and Sauron in the glen above Pitlochry. I would recommend anyone wishing to visit a Scotch Whisky Distillery visit Edradour and you will see and learn how Scotch was traditionally hand-crafted before the Victorian Era, the age of industrialisation and the modern-day mass corporations and their space-age whisky factories. It is no wonder we here at The Whiskyphiles have a real affinity for the whisky produced at Edradour – it is simply fantastic! 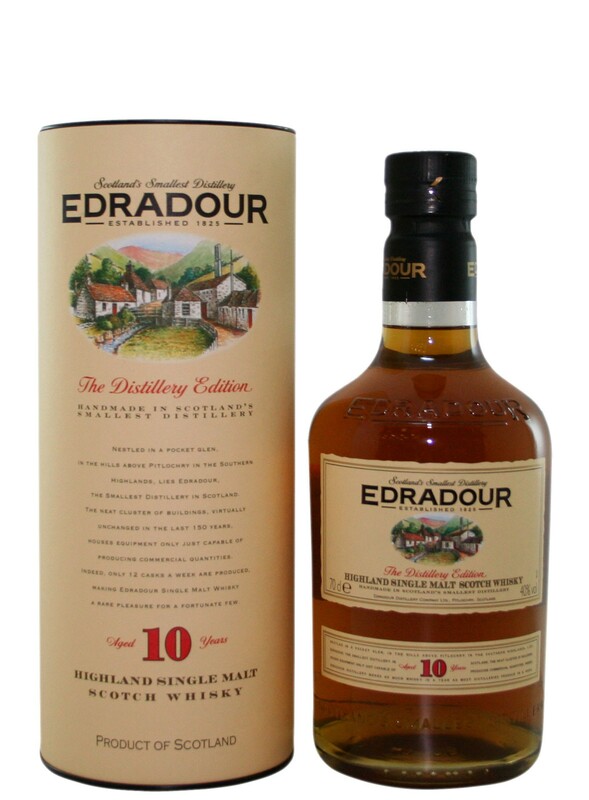 This 10 Year Old expression from Edradour is initially sweet and delicate before it reveals its depth and complexity. A very enjoyable dram and a stunning example for a basic (or stable) distillery expression. Yes I would happily part with my hard-earned cash for anything with Edradour on the label and this is no exception.